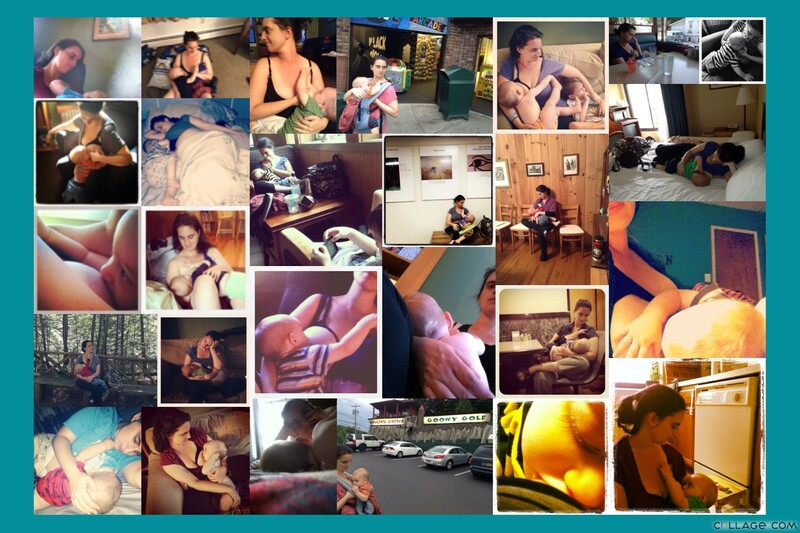 For (almost) every day in August, I took a picture of myself nursing my baby, and shared it here on my blog, on Facebook, and on Instagram. It was National Breastfeeding Month, and it seemed like something interesting to do. At first, I did have some reservations about sharing such an intimate act with the world (here are some of my thoughts on that), but soon it just became part of life. I received a lot of positive feedback from friends and strangers. Some people were inspired to do the same, and shared their photos with me privately and on Facebook. Some were just inspired in general about breastfeeding. One mom told me these pictures made her want to try harder to nurse her next child. That alone felt like it was all worth it. One interesting thing that happened during this month of photo-taking was that I started to have a certain self-consciousness any time I was nursing the baby. I started to wonder if that particular nursing session would be a good photo. On the one hand, this wasn’t entirely positive for me. I felt a little bit of pressure to come up with something different each day. How many pictures can we take nursing on the couch, in bed, in the armchair, etc.? It occurred to me that I don’t get out a lot, as so many of the pictures were taken at home. Mommy guilt set in: Should I be taking my children on more outings? Am I really that boring? Do they spend too much time indoors? You know the drill. And I felt a little like I wasn’t always “living in the now” while I nursed him. I felt like there was a spotlight on us, even when we weren’t being photographed, because I was viewing us like we were in a picture. At the same time, there was something eye-opening about this. I thought about just how very ordinary breastfeeding is, how much of a mindless activity it is, and is meant to be. At 10 months old (now 11 months! ), my baby nurses numerous times each day. The nursing sessions just fit into the daily routines of life. Nursing isn’t “special” — it’s as essential as breathing, sleeping, walking, getting dressed, answering the phone, etc. There is nothing “picturesque” about it. It’s just life. And in a way, that is what I loved about capturing these moments with the baby — the two of us nursing on the kitchen floor, against a pile of laundry. Nursing is normal, and normal is beautiful. And then, of course, there was the intimate, personal aspect of all this. When the light shone on our moments together, these very simple, necessary times that I stopped what I was doing, cradled the baby in my lap, and fed and soothed him — well, I began to get very sentimental! In this month of photographs, this boy of mine perfected his walking skills, pointing skills, and dancing moves. He is edging closer than ever to toddlerhood, and soon we will be celebrating his first birthday. These days of cradling him in my lap in this exact way, with his legs tucked in precisely this much, his hands reaching up to grab my nose, his fingers fiddling with the moles near my shoulder — these days are numbered. Nursing him will continue for quite some time still, but it will never be just like this. So I am glad I caught some of those moments on film, and doing so made me focus on them even more, and soak it in.